Novation Circuit Groove Box ! Lets break down what this ultra portable synthesized work station has under the hood in this Novation Circuit Review. This bad bwoy is a standalone groove box that is packed with features such as the playable pads, tweakable knobs, plus stacks of synth and drum sounds that allow you to make electronic music quickly and easily in both sequence and the newly added sample flip mode. This is a powerful and portable groove box, that has been designed primarily to work in standalone mode, meaning you don’t need a computer or laptop to make electronic beats instantly and can be integrated with other midi hardware gear and your DAW of choice. The Novation Circuit is perfect for people that are new to producing electronic music and will give you great hands on experience while making live electro, step sequencing, adding effects and tweaking sounds. Veterans of music production might find this piece of gear a bit restricting with only 60 seconds of sample time to store the 2 X drums and 4 X synths. However, the team at Novation have been constantly updating the firmware on this little portable groove box adding Circuits own custom software, Novation Component, that allows to change out your sounds and backup your Circuit content. So if you’re new to producing or you’re in the market for a portable jam session tool that you can pull out on the plane, then load into your laptop once you hit the tarmac keep reading as the Novation Circuit might be what you’re looking for. At a quick glance you could easily mistake this stand alone groove box for the popular 64 grid midi pad controller the Launchpad Pro, but don’t be mistaken this is not another midi controller. 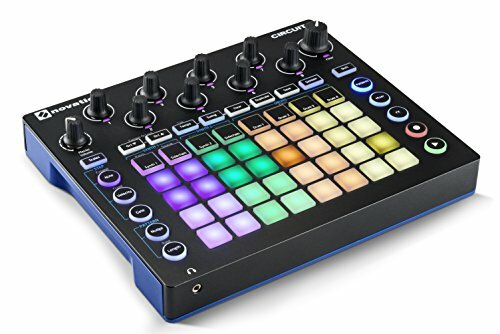 Novation has created the Circuit to help beat makers, producers, and musicians to make electronic drums and synth-based tracks quickly and easily, with the ability to innovate and experiment without a degree in sound engineering or an expensive studio. This certainly plays well together with the high portability factor: Circuit comes with an intuitive grid-based sequencer, ability to work without a computer, possibility to work battery powered and a form-factor (5 x 24 x 20 cm, weight 0.95 kg) that is just screaming to be taken on the road. The desktop unit even includes a built-in speaker. 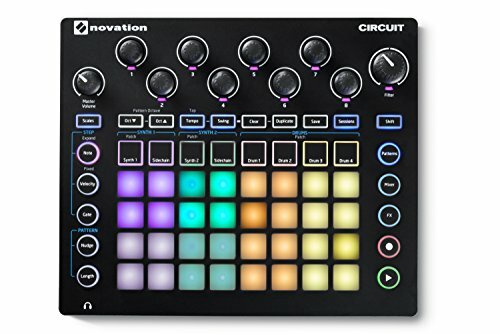 The circuit includes two 6-voice Novation polysynths with the sound that follows their Nova-heritage and a 4-part drum machine will guarantee that Circuit doesn’t sound like a toy. The main unit is made of hard plastic that is both durable and lightweight. It sports a matte black and white color-scheme at the top and navy blue at the bottom side of the unit. The Circuit comes with 32 RGB LED illuminated velocity sensitive buttons and 28 backlit function buttons. A further 8 continuous knobs with RGB indicator LEDs guarantee that this device is easy to read even in low light conditions. There are dedicated buttons and knobs for all essential features, such as synth and drum selection, scale selection, filter, pattern, mixer, and fx view as well as programming. 8 assignable macro knobs can be used to control a lot of hidden parameters and mappings underneath the surface. The synth section also includes two dedicated sidechain buttons that are used to assign the synth to use drum track 1 signal as key input to create the popular ‘ducking’ effect. Connections include 12V DC power, 1 x USB type B port, MIDI in/out ports (using separate breakout cables) and 2 x 1/4″ L/R output at the back of the unit and dedicated 1/8″ headphone connector at front. extended by chaining patterns together on the fly to play longer sequences. The sessions can be also switched in real time, which enables you to expand a song idea anywhere between 1-32 sessions. Functions, such as drum sequencer or the pattern select screen, Novation Circuit takes a step away from the typical sequencer approach you’d expect to find in many synths and drum machines. Instead, the engine running inside Circuit should be compared to a simplified version of Ableton Live, which is great news for anyone who is already familiar with Live. The sessions page gives you access to a maximum of 32 saved sessions. Each session basically consists of loops made using the built-in two polysynths and four-part drum machine. One session is limited to 8 patterns consisting of 16 steps for each sound but this can be recoded with different colors and are easily distinguishable on the pads. The velocity-sensitive pad functionality extends from typical MPC-style beat making to melody or chord creation that makes use of scale locking (dedicated scales button and pad controls) to help with the process. Note data can be recorded in three ways: using a dedicated button while playing, dialing one note at the time manually through 16 steps or through Midi input. Novation has released a couple of very useful updates for Circuit since it’s initial release: the new Circuit Pack file format (firmware update 1.4) now combines all sessions, samples, and patches in a single file that makes archiving and sharing much easier. These files can be managed through a free Circuit Components tool (available as browser based or desktop version) that enables you to save sessions and update the device firmware. Circuit Components tool enables you to replace the drum parts with 60 seconds of your own sample material. The latest 1.5 update added increased expression of sequences and closer representation of live-recorded parts. Novation also released a powerful Editor, designed by Isotonik Studios, that can access every synth parameter of Circuit’s two powerful polysynths and it’s geared towards designing complex patches on your computer. Novation Circuit is shipped with a copy of Ableton Live Lite and 1 GB of sounds and samples from Loopmasters. The Novation Circuit is a great take on the traditional groove box and packs a lot of punch in such a small unit. The Novation hallmark synth sounds combined with clever and intuitive engine plus tactile controls at this price point is a clear winner: Korg’s similarly priced Electribe 2 sampler doesn’t feature a synth engine and Native Instrument Machine Jam requires a computer to work. And it looks gorgeous, too. Novation states that Circuit’s “maximum creative output from minimum input” encourages exploration and creates ‘happy accidents’. From the user interface point of view, this is certainly correct: the sequencing approach takes almost no time to learn and the RGB indicators give a nice color-coded user experience that is definitely a deal-breaker when you’re looking for something to take on a gig. The velocity sensitive pads feel great and the knobs have enough resistance to be useful. Portability seems to be the biggest winning factor here though: using Circuit with battery power and sequencing away with no need for laptop is a ridiculously good experience here. But Circuit certainly has its place on a studio desk too with its intuitive user interface. I wouldn’t go as far to say that Novation has built a “Launchpad killer” or even tried to do so, but rather created a creative standalone tool that has features no competitor can currently offer at this price point.